For years my book club friend, Kristen, made waves by serving this dish for one of our meetings. She scored the recipe from the amazing Ina Gartner, and it's become a fall staple for our family. If you haven't ever discovered this recipe, you can get the concise version on Food Network (here) or if you want the visuals to go along with the process, scroll down. 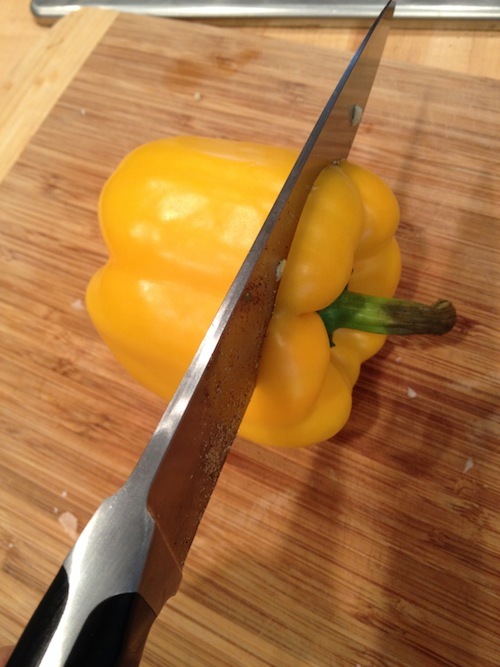 The biggest thing about this recipe is all of the chopping, so I want to give you a few knife tips to make the chopping go faster. 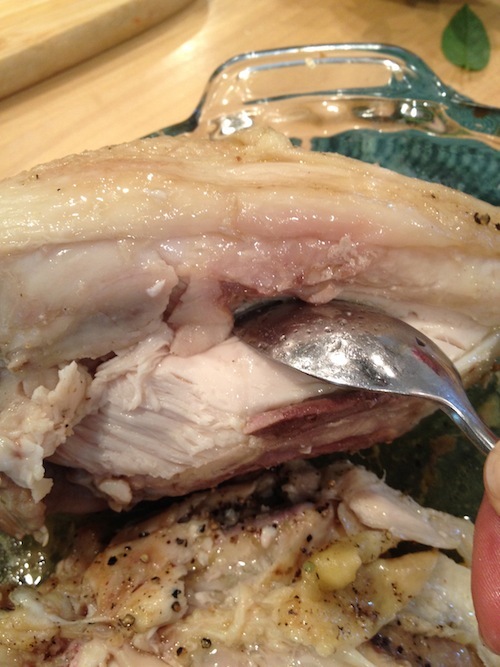 Always use split breasts with bones and skin because when you bake, the meat will be MUCH more moist than boneless & skinless. While the chicken is baking, start the chopping. Begin with the onions. TIP: Try and go through the entire onion cutting process with your mouth shut tight ( I purse my lips) and this will greatly reduce your tears! Begin by cut the top of the onion off, but leave the bottom in tact. (the part with the dried up roots) Then cut in half and peel off the outer layer of skin.Next, cut into the onion along the lines running perpendicular to the root base. You can roughly follow the lines. Cut JUST SHORT of the root, so the pieces stay attached. 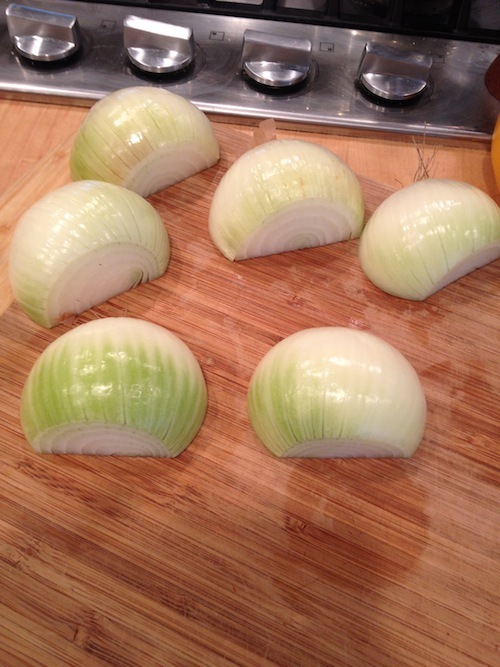 Do this for ALL of the onions you're going to use before going to the next step. 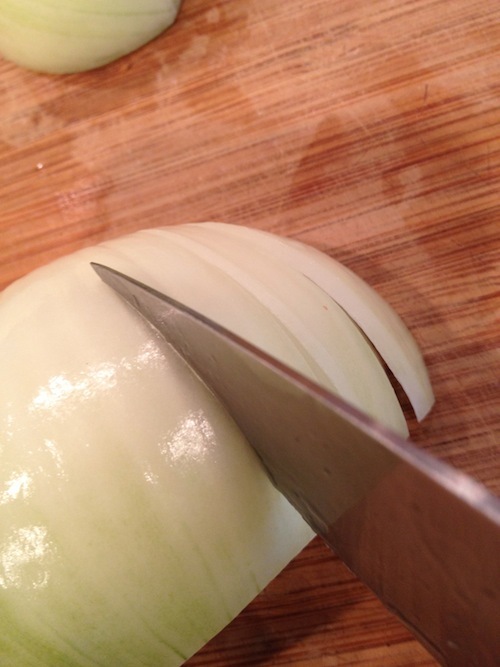 After completing the cuts, turn the onion so you are now cutting perpendicular to the cuts you just made.This is will result in nearly perfectly diced onions. Beautiful!Heat the olive oil over medium heat in a dutch oven or other large pot and add the onions. Cook until they are translucent, usually 10 minutes or so.Smash and dice the garlic. ( Remember the quick tip?!) Add to the onions for the last minute. Don't add earlier because the garlic cooks much faster than onions and will turn bitter if it gets brown.To dice the peppers, I love this technique I learned in a cooking class years ago. 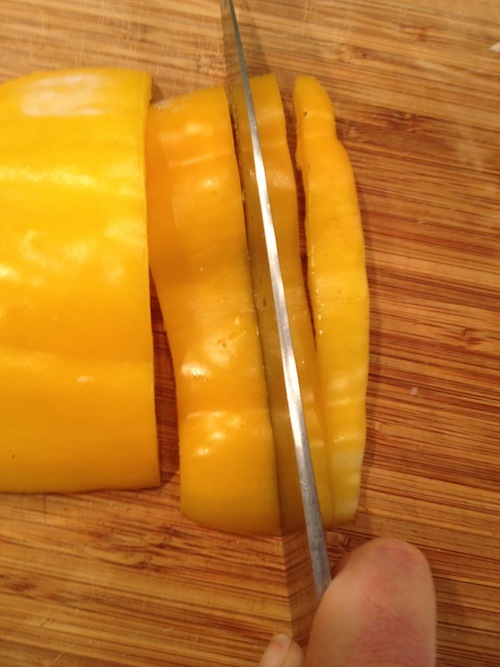 Begin by cutting the top and bottom off of the pepper.Turn the pepper so it's standing up straight and make a slit down one side of the pepper.Turn the pepper on its side then use your knife to cut around the pepper, removing the white ribs from the side which will also disconnect the center with all of the seeds.The result is a long, clean strip of pepper. Lovely!Cut this strip in half across the short side, then cut along the long side to make nice even pieces.After making these pieces, bunch together and dice.Add the peppers and spices to the onions and cook for another minute or two.The "official" recipe calls for a can of whole tomatoes and, if I have them, I use them and tear them apart with my hands. However, most of the time I only have diced tomatoes handy, and they are a worthy substitute. When you add the tomatoes, toss in the basil as well. 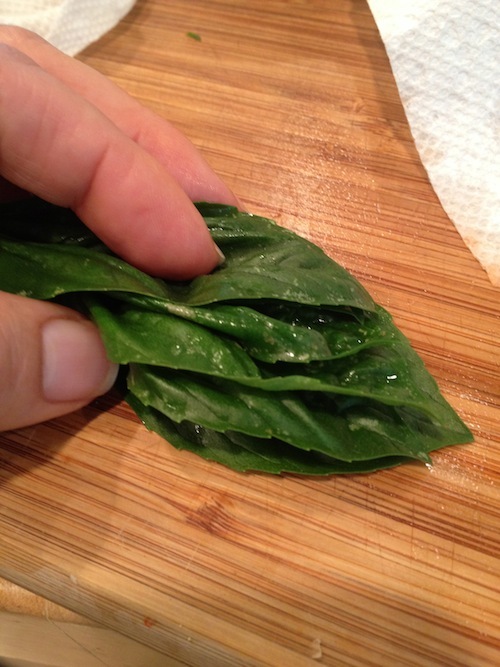 I shred basil by first stacking the leaves together.Then roll the leaves tightly.Make small, even slices (julienne) with a sharp knife.Separate with your fingers before adding to the chili.After adding the tomatoes and basil, bring the chili to a boil then reduce the heat and allow the flavors to simmer for 30 minutes. Add the chicken and simmer for an additional 20 minutes or so.I made this for a crowd and forgot to take a pictures of our bowls, but imagine the image above along with a dollop of sour cream and a sprinkle of grated cheese. Some of us may have even added a few dashes of Tapatio!